The Delaware office remains a NOAA-centric office, focused on Operations and Maintenance contracts for NOAA PORTS® networks. Presently the office has four staff members based in Dover, DE and an additional technician in Gloucester, VA. 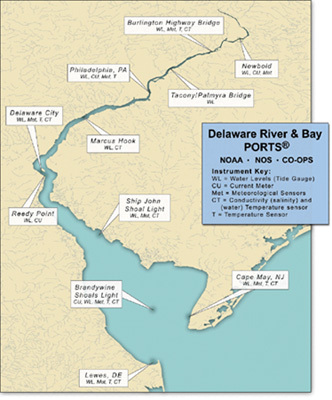 The Delaware office directly services three of the five PORTS® systems under contract by Woods Hole Group; including the Delaware River and Bay PORTS®, Chesapeake Bay PORTS®, and New York/New Jersey Harbor PORTS®. In addition to performing the routine service for these three systems, the Delaware office provides support for two other PORTS ® contracts outside the Mid-Atlantic region; including Narragansett Bay PORTS® and Lake Charles PORTS®. Woods Hole Group also supports PORTS® in Long Beach and Los Angeles, CA. In the past year, Woods Hole Group won the renewal contract to retain the New York/New Jersey Harbor PORTS® system for an additional three years, until 2014. The largest accomplishment for the Delaware office over the past year has been the successful completion of the 2011 Annual Inspection requirement for the 11 water level stations in Delaware and New York. This was the first major accomplishment of our newly formed in-house geodetic leveling program out of the Delaware office. With the successful completion of the leveling task and documentation packages associated with annual maintenance and installation of NOAA water level stations, Woods Hole Group is poised to expand its service offering. In addition to NOAA projects, the Delaware office just completed assisting the Falmouth office on the Rehoboth Outfall Project in Rehoboth, DE. Delaware personnel assisted in the deployments and recoveries of current meter systems and performed the required bimonthly CTD profiles over the past year. The strategic aim of the Delaware office is to exceed NOAA's expectations and continue to establish a strong presence in the Mid-Atlantic area with NOAA and other customers. On a final note, Susan O’Malley, who has served as the Administrative Assistant to the Delaware office for the past six years, has decided to leave Woods Hole Group as she and her family will be moving back to the Northeast. Woods Hole Group and the Delaware office wish her and her family our best. She will be missed as a part of the Woods Hole Group family in the Delaware office.